This is Scientific & Academic Publishing, USA. Nice to get your information from the journal PLOS Pathogens and also happy to pass on our regards to you from the editorial department of SAP. We've finished reading the abstract of your paper Transformation of Natural Genetic Variation into Haemophilus Influenzae Genomes and will recommend it to our editors. If you are interested in our journals and want to publish it on our journals, please extend this paper and describe your latest research achievements and send it to us by our online submission system (http://www.manuscriptsystem.com). All manuscripts submitted will be considered for publication. In the second paragraph they seem to be first saying they'll recommend my already-published paper to their editors (for the editors to do what, read it with admiration? ), and then asking me to add a bit of new material to it and submit it to them for publication. This reeks of self-plagiarization. But in the next sentence they ask for other papers instead. Who are these guys? Their web site lists an impressive 133 journal titles. But most of the ones I clicked on are nonexistent - they have some Editorial Board members but no Editor in Chief or ISBN number, and haven't published any papers. Only one (The International Journal of Plant Research) had 'published' any papers, and these each had only Abstract and reference list- the body of the paper was apparently 'coming soon'. Perhaps this is to be expected, given that this journal too lacks an Editor in Chief. It may lack editors entirely - authors are instructed that they must format the html links for the references they cite, a function normally done by a journal's copy editors. Their office is in California, so they're not a third-world effort. I couldn't find any information about publication charges at all, but I don't suppose they're just doing this for the glory. 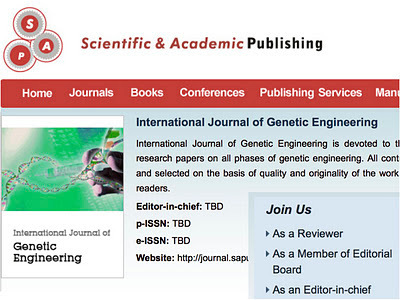 Hmm, the International Journal of Genetic Engineering needs an Editor in Chief - that would look good on my CV. All I need to do is check the boxes on the handy application form they provide! I believe these kind of companies use an office in the US, UK, etc. as fronts for these fee-to-publish journals. It might not be a third-world enterprise, but it surely reads like one (think: Nigerian princes and all). I'm a foreigner and my eyes still hurt after reading their website. I try to send an email to them through feedback link, but failed! "for the editors to do what, read it with admiration?" Thanks for sharing your experience, such frauds should not get away with it. They are just taking advantage of these hard times we are living. "Authors are generally required to pay a $300 publication charge. Authors from developing countries will be offered discounts on the publication fee. The authors must pay an additional fee for mailing and printing costs if the journal's hardcopy is needed. It is a flat fee that does not vary based on word count or use of color figures." I wish these people could be taken DOWN. I recently found an article that I almost cited in my dissertation before realizing I had another article JUST LIKE IT, only with slightly different numbers and name change. The SAP had published a completely plagiarized article with fabricated data.